Sensational headlines too quick to call for a housing downturn may face pushback from expansion in the tech industry. Seattle remains the top tech-30 market in North America, according to the CBRE Tech Report, with high-tech jobs expanding 26 percent over the last two years. Colliers Research is tracking nearly 6.5 million square feet of Class A office space in Seattle and reports 66.2 percent is now occupied by tech users, representing an estimated 30,000 “information-worker/STEM/FIRE” jobs with another 120,000 workers supporting those jobs. Meanwhile, millions of square feet of new office space in active development precipitates further job growth and sustained housing demand ahead. Housing inventories across King County have risen steadily since May and pending sales waned into the summer doldrums, until reversing course more recently. Closed sales in October are already trending 10 percent higher than September throughout the metro area as buyers spring back. It comes down to jobs, population growth and a preference to own vs. rent as mortgage rate increases loom following the mid-term elections. Consumers are stepping up when seasonal market trends (both listings and sales volumes) typically step back during the fourth quarter. Brokers report improved selection and seller willingness to negotiate are encouraging buyers off the sidelines while the cost of borrowing remains attractive and so tax benefits get calendared in 2018. This trend is most pronounced near urban job centers where thriving tech companies continue to stoke housing demand, especially at affordable price points. Pending sales in downtown Seattle increased by 40-percent in September over August, according to a review of NWMLS data – that’s an important statistic because pending sales in one month typically record as closed sales the next month and closed sales drive the headlines. Despite increased resale supply, the year will most likely close out a balanced market. Meanwhile, new high-rise condominiums are posting strong reservation activity as hundreds of presale buyers plan ahead for their future, typically two years before occupancy. Jones says housing statistics measured month-over-month or quarter-over-quarter may be fodder for provocative editorial, but it doesn’t make a market. He believes the regional economic fundamentals, led by a preference for tech employer, are deeply rooted. The Seattle metro area has become a darling for new and established tech companies attracted to relative affordability. This aids in the recruiting and retention of top talent and creates sustained housing demand. Consider an average salary for a software engineer in Seattle is $108,000 compared to $118,000 in San Francisco. That delta of $10,000 per year is quickly gobbled up by California’s State income tax while fortunately, there’s no such tax in Washington. Now, according to JLL Research, the typical one-bedroom annual apartment rent in San Francisco is $45,288 compared to just $27,864 in Seattle for a similar lifestyle. Factoring these differences, a Seattle tech professional enjoys a 73 percent increase in disposable income compared with a peer in the Bay Area. That upside helps to build up savings for a future down payment on a home purchase. New recruits also typically vest their stock options after a few years, which is common within the tech industry and this windfall encourages renters to become homebuyers. Bay Area tech titans like Facebook, Google, Apple, UBER, Oracle, Adobe, Dropbox and Twitter are just a few companies headquartered in California, yet currently occupying more than 2.5 million square feet of Seattle area office space. Google and Facebook alone will consume another 1.5 million square feet by 2020. Combined they will likely draw another 10,000 high-paying tech jobs to Seattle in the short term. This on top of meteoric growth at Amazon, which already controls more than 11 million square feet of office space in downtown Seattle. Much has been speculated about Amazon’s second headquarters (“HQ2”) and its effect on Seattle. However, since the September 7, 2017 announcement about plans for HQ2, Amazon has committed to another 2.4 million square feet with room for another 14,000 new recruits. Sound Transit 3, a $55 billion transportation package will certainly offer relief but it will be another decade before the region feels the full benefit, according to Jones. He notes a number of developer clients are specifically planning residential projects near existing (or planned) transit centers for this very reason. Still most are developing in downtown Seattle. Supply will also rise but building to affordable price points remains a challenge. Construction costs are increasing quickly due to a record number of new developments. According to The Downtown Seattle Association, the city is currently experiencing $5.6 billion in projects topping last year’s record of $5 billion (224 projects are in the pipeline – nearly as many as were completed in the previous eight years). Last year, downtown Seattle represented 20 percent of all the CBD office construction in the nation while hotel development booms in anticipation of the $1.7 billion expansion of the Washington State Convention Center. This doesn’t include billions of dollars in capital projects like the new HWY 99 tunnel, the waterfront revitalization, expansion of the Seattle Streetcar and other infrastructure updates required by the fastest-growing large city in the US. Commercial developers are also optimistic about the prospects for more job growth in downtown Seattle. Nearly 2 million sq. ft. of speculative office space is currently under construction with occupancy by 2020. That space will soon attract additional leases and an estimated 13,000 new jobs ahead in the relatively near term. • Amazon now owns twice as much office space as it did in 2016 and reportedly will occupy 15 million sq. ft. of office space throughout downtown Seattle with current commitments. • Apple is expanding within Two Union Square with more than 70,000 sq. ft. to office 500 employees (rumors persist that it is making plays on large office commitments). • Google continues to expand in South Lake Union with five buildings either under construction or planning, comprising nearly 1 million sq. ft. of office space with occupancy expected by early 2019 – the campus could employ more than 4,500 employees. • Facebook has opened a new campus at 1101 Westlake in addition to other leaseholds in South Lake Union with current capacity for 3,000 employees. The social media giant recently applied for permits for Oculus expansion of more than 60,000 sq. ft. of office space in the Home Plate Center near Safeco Field in SODO – it’s presumed the company leased all 124,000 sq. ft. of the available space, but is merely building out the first half at this time with future plans to grow. • F5 Networks has leased 516,000 sq. ft. in a new office tower (now called F5 Tower) with an estimated 1,500 employees and room to expand. Excess office space is being sublet and attracting other employers. • Expedia has plans to begin relocating its headquarters to Interbay (Seattle waterfront) in 2019 in what may eventually be comprised of 1.9 million sq. ft. of office space for approximately 8,000 employees (recent indications suggest the company will moderate its growth in measured phases). • WeWork Northwest continues to expand in the Seattle region and is noted to be eying a total of 2 million sq. ft. of office space in the greater Seattle area with new commitments in the World Trade Center North building and a 36-story tower being developed by Martin Selig Real Estate in Belltown (this tenant is critical for future growth in tech as many startups are incubating in co-working environments). • Amazon occupies one office tower in Bellevue with 2,000 employees and plans for another with the potential of adding another 2,500 employees by 2020 - that's 10-percent of the regional headcount. • Vulcan Real Estate is planning 3 million sq. ft. of office space - likely to target additional expansion of Amazon and other tech users. This developer is very close to the tech growth, and their commitment to Bellevue is a strong signal of additional tech expansion in the region. • Tableau Software has preleased 180,000 sq. ft. of Kirkland Urban for occupancy in 2019. • Facebook will reportedly develop 1 million sq. ft. of office space in Redmond and along Willows Road. • Microsoft is doubling down on its own campus rebirth with a multi-billion-dollar expansion that could office upwards of 8,000 employees. • SRM is planning a 136,000 sq. ft. building adjacent to Google's Kirkland campus, likely for Google’s continued expansion. • Rumors persist about expansion of Alibaba and other international tech companies seeking growth in the region (including potential leases at Southport on the Renton waterfront). • While not tech-oriented, Costco Wholesale recently announced plans to expand it’s Issaquah headquarters by 1.2 million sq. ft. with room for 4,000 employees. 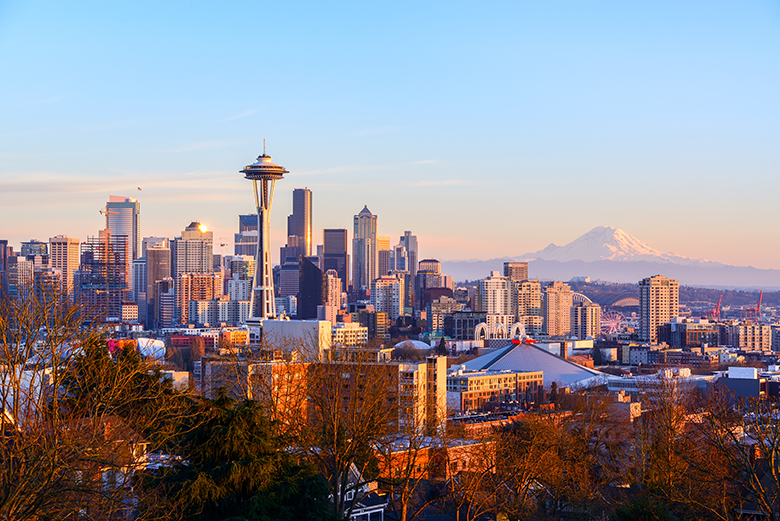 The region’s relative affordability, high-quality of life, lack of a State income tax and investments in transportation infrastructure will help keep the Seattle metro area competitive on the West Coast.